Craft Beer Market Growth The numbers don't lie. 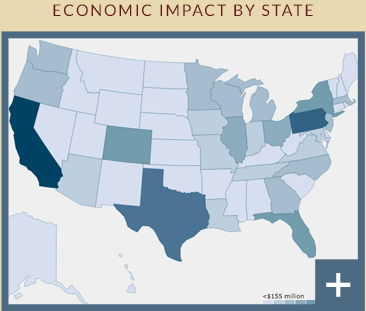 Craft beer is a $26 billion-dollar industry. Yet it’s still full of untapped potential. The amount of consumer interest in this budding category is truly jaw dropping. Have a look at the numbers for craft beer market growth and you’ll see what we mean. Below are craft beer growth statistics covering both sales and production. Chart showing U.S. Beer Production Volume in 2017. Overall Beer volume down 1%. Craft Beer volume up 5%. 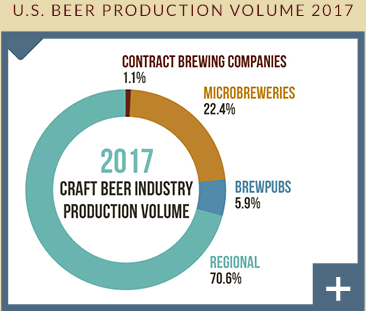 2017 Craft Industry Production Volume: Contract Brewing Companies: 1.1%. Microbreweries: 22.4%. Brewpubs: 5.9%. Regional: 70.6%. Information provided by the Brewers Association in Boulder CO. 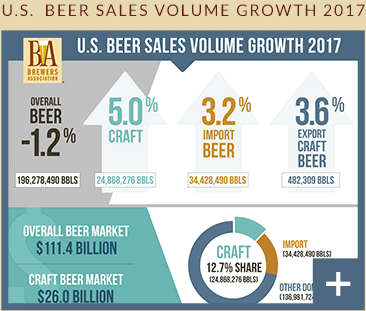 Chart showing U.S. Beer Sales Volume Growth in 2017. Overall Beer down 1.2% (196,278,490 BBLS). Craft Beer up 5.0% (24,868,276 BBLS). Import Beer up 3.2%. Export craft beer up 3.6% (482,309 BBLS). Overall Beer Market: $111.4 Billion. Craft Beer Market $26.0 Billion (8% dollar sales growth). Beer market breakdown: Craft Beer 12.7% Share (24,868,276 BBLS). Import Beer: 34,428,490 BBLS. Other Domestic Beer: 136,981,724 BBLS. Information provided by the Brewers Association in Boulder CO.